Former police officer Drew Peterson threw his wife to the floor one night, grabbed her throat and told her he "could kill her there and then," a one-time co-worker of the wife testified Tuesday at a hearing to determine what evidence can be admitted in Peterson's murder trial. Kathleen Savio, Drew Peterson's third wife, who mysteriously drowned in a bathtub six years ago, essentially is testifying from the grave during the hearing. Witnesses are expected to tell a judge how Savio discussed and wrote about her fears that Peterson, a former Bolingbrook police sergeant, would kill her. The hearing, projected to last three weeks, is expected to provide the first detailed look at evidence prosecutors contend ties Peterson to Savio's 2004 death. It stems from a state law that allows a judge to admit hearsay evidence in first-degree murder cases if prosecutors can prove a defendant killed a witness to prevent him or her from testifying. Issam Karam, who said he worked with Savio at Parkway Imaging in Romeoville in late 2003, testified that Savio told him she had come home one night looking forward to a bath and glass of wine when Peterson threw her to the floor. Savio said the incident occurred after she had changed the locks to the home. Karam said Peterson grabbed Savio's throat and had a knife. Savio showed him a bruise on her arm, Karam said. "(Peterson) said nothing that she could do would make her safe," Karam said. "She could not run or hide. He could kill her there and then." Another witness, Savio's boss, testified that a number of times a Bolingbrook squad car was parked in front of her Romeoville business while Savio was inside. Lisa Mordente said that on one occasion, Savio was returning from lunch and approached another vehicle parked outside and spoke to a man inside. "She was very shaken up when she came back in, her hand was shaking, she had tears, she was a mess," Mordente said. Mordente also testified that Savio told her it was Peterson outside and they were fighting over money. Mordente's testimony highlighted what is sure to be a key part of the trial  the fact that Peterson was a police officer. His attorneys have raised questions about why witnesses didn't notify police if they believed Savio feared Peterson. Mordente said she didn't call police when she learned Savio died "because it wouldn't have helped." "Kathleen had stated on several occasions she had called police," Mordente said. During the hearing, prosecutors will present to Will County Judge Stephen White about 60 witnesses to testify about 15 hearsay statements. White will then decide if the jury can hear any or all of those statements when Peterson stands trial. Peterson has pleaded not guilty to murdering Savio, whose body was found in a dry tub. A trial date hasn't been set. The Illinois Legislature passed the hearsay law after authorities named Peterson a suspect in the 2007 disappearance of his fourth wife, Stacy, then exhumed the body of Savio and reopened the investigation into her death. While neither side has talked much about the evidence in the case, from the day Peterson was arrested, Will County State's Attorney James Glasgow has made it clear that allowing Savio to tell jurors why Peterson wanted her dead is crucial to his case. "In essence, what you're basically allowing the victim of a violent crime to do is testify from the grave," Glasgow, who pushed for passage of the bill, told reporters in May shortly after Peterson was arrested. The list of witnesses remains under seal, but Savio's niece, Melissa Doman, said her mother, Anna Doman, is among those who have been called to testify. "It would be about things my Aunt Kitty (Savio) told my mom about how she was afraid for her life, she said she was afraid of Drew," Melissa Doman said, adding that she has not been called to testify. Also expected to testify are other members of Savio's family, including her sister, Susan Savio. It was Susan Savio who told a coroner's jury shortly after her sister's death that Kathleen Savio had told family members that, "if she would die, it may look like an accident, but it wasn't." The death initially was ruled an accidental drowning  until Stacy Peterson's disappearance led officials to exhume Savio's body, conduct another autopsy and conclude Savio was the victim of a homicide. 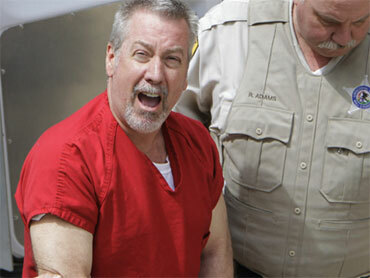 Drew Peterson has not been charged in Stacy Peterson's disappearance. Other possible witnesses who could be asked to testify about the stormy relationship between Drew Peterson and Savio are his former colleagues. Eighteen times in two years, police were called to the couple's Bolingbrook home to respond to reports of trouble between the two, with Savio telling officers that her husband had beaten her and threatened to kill her. Peterson was never charged. Savio was charged with domestic battery and later was acquitted. There also are court documents that prosecutors are expected to present into evidence, including a 2002 order of protection in which Savio alleges that Peterson knocked her down, ripped off her necklace and left marks on her body. "He wants me dead, and if he has to, he will burn the house down just to shut me up," she wrote. Among the more intriguing possible witnesses are members of the clergy at a Bolingbrook church attended by Stacy Peterson. In the days after her disappearance, there were media reports that she had told a clergyman a couple months earlier that Drew Peterson had confessed to her that he killed Savio and made it look like an accident. Peterson's attorneys have made it clear that they will attack the credibility of at least some of the witnesses. "All it is, is rumor, innuendo and gossip," defense attorney Joel Brodsky said after a recent hearing concerning information contained in the 15 statements. "People had ulterior motives for saying what they said or are out-and-out unreliable people." The defense is not expected to call any witnesses of its own during the hearing.